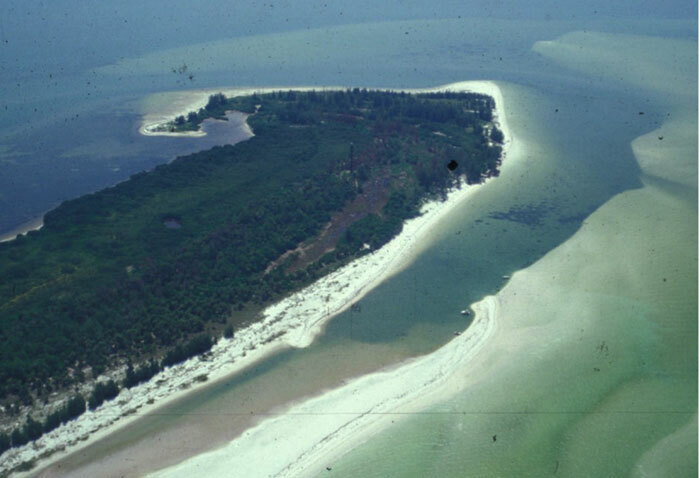 By Richard A. Davis, Jr.
Anclote Key is a wave-dominated barrier island on the Gulf peninsular coast of Florida near Tarpon Springs. This is the northernmost barrier in this system of 30 barrier islands and a like number of tidal inlets. It lies about 4 km from the mainland and is in the State Park system of Florida. Because of its relatively remote location and the fact that it must be accessed by boat, the barrier is pristine as Florida barriers go. There is ferry service from Tarpon Springs. It is densely populated during the weekends and it has become a favorite place for campers although camping is primitive with no facilities. 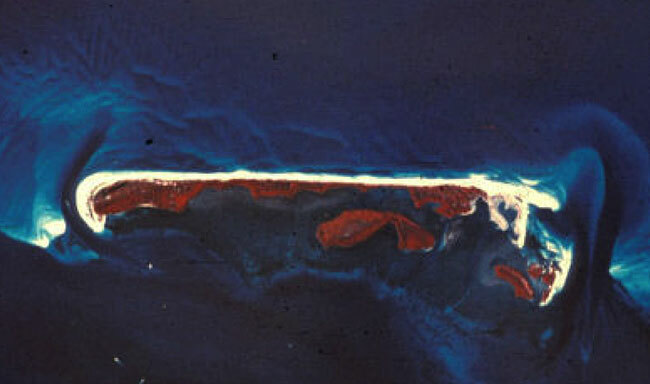 Anclote Key is about 5 km long and only a couple of hundred meters wide at most places. There is a non-functional lighthouse at the southern end that was built in 1887; it operated until 1984 (figure 1; see above photo gallery). Initially there was a resident keeper and then it was automated by the U.S. Coast Guard in 1952. 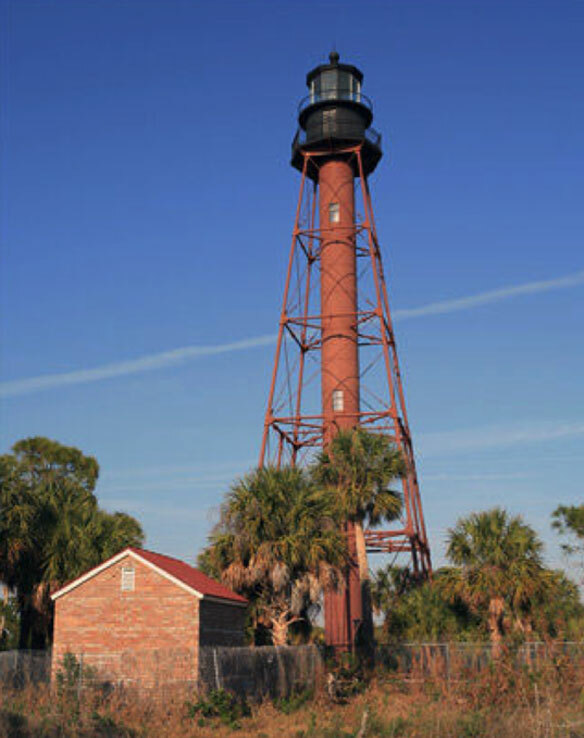 There has been a strong effort to maintain and restore the lighthouse by an organized group of citizens. Recently a residence for a park ranger was constructed. This wave-dominated barrier is subjected to a mean annual significant wave height of about 0.5 meters and a spring tidal range of 0.90 meter. It has a channel at each end that functions as a tidal inlet although there are no barriers adjacent on each end of the island. The channels are about 3 m deep and are being filled with sand. The island has an excellent beach that shows accretion although erosion has taken place with washovers during the past few decades. Dunes are present throughout the extent of the island but the maximum elevation is less than 3 meters. Landward of this foredune complex on a relict washover apron are mangroves that comprise the entire backbarrier shoreline. This barrier island rests on only a few meters of Quaternary sediment which is on top of Miocene limestone. In fact, landward on the mainland these limestones crop out near sea level. Gulfward from Anclote Key the substrate is sand with scattered shells and shell debris. These sediments extend only for a kilometer or so and thin out exposing the same Miocene limestones at about 6 m depth. The aspect of Anclote Key that is most interesting is the rapid rate of change that has taken place over the past few decades and that is continuing. These rapid changes have taken place in the absence of major weather events. The impetus for these changes has been a major change in the offshore environment along this part of the Florida coast. 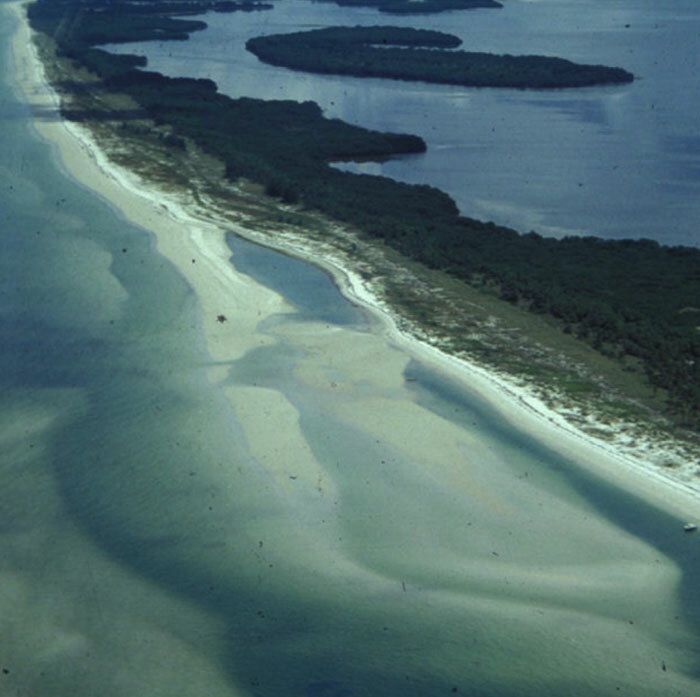 Field observations and aerial photos show that until about 1960 seagrass covered most of the bottom of the shallow Gulf up to only a few hundred meters of the shoreline. This situation existed for a significant reach of the coast from north of Anclote Key to at least the northern part of Clearwater Beach Island, about 25 km in extent. Sometime shortly after 1960 these seagrass beds were gone. Multiple reasons have been given including increased water temperature, harvesting by sea urchins and general decrease in water quality. None of these has gained significant acceptance. The bottom line is that the demise of these seagrasses is a mystery. The consequences of their demise has had significant changes in the shore area sedimentation. Huge volumes of sand were transported shoreward and accreted at the shorelines of multiple barriers along the coast beginning in the 1960s and continuing today. 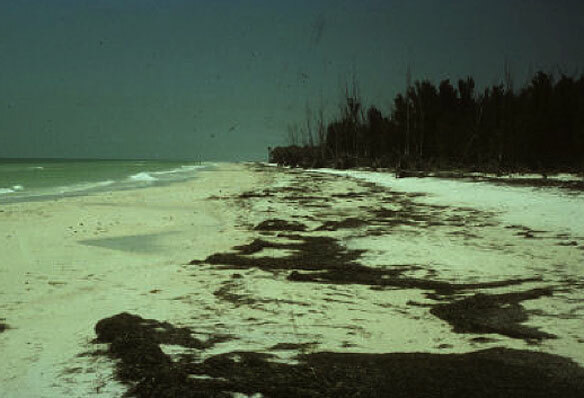 As an example, northern Clearwater Beach Island was experiencing erosion in the early 1950s as was the case for much of this coast. A vertical concrete seawall was constructed to protect expensive homes that lined the coast. At the present time there is about 200 meters of beach and dunes in front of this seawall, all due to natural accretion. 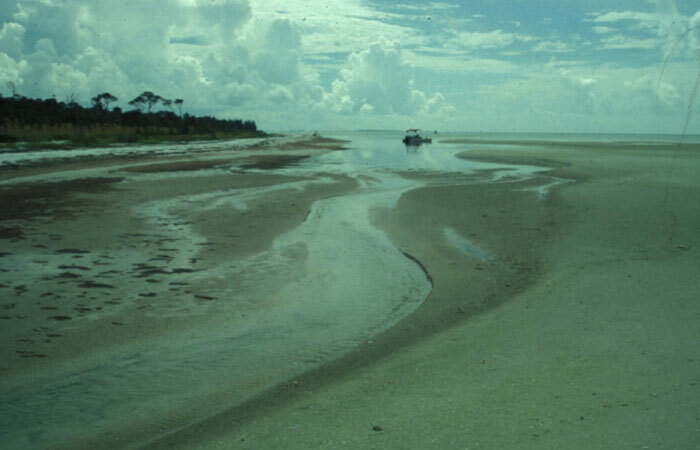 Anclote Key itself has experienced considerable sediment accretion. It was a narrow barrier in the early 1970s (figure 2). The north end of the island was initially the most affected by this additional sand (figure 3). The demise of the sea grass community released the sand substrate to mobility and the wave climate moved it to the shoreline. Longshore currents in this area persist from the south to north, thus the huge additional sediment on the north end of the barrier. Its northern movement was halted by the tidal channel. There was also accretion on the south end of Anclote Key but not as much as on the north. The old boat dock used by the lighthouse keeper and the Coast Guard was rendered useless by this accretion. 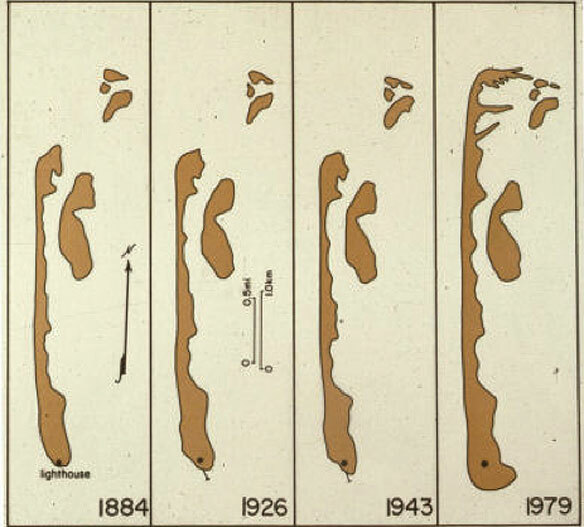 Historical data show that little change in the size and shape of the island took place until this release of sediment in the 1960s (figure 4). Although no hurricanes impacted this area since 1921, there was a tropical storm, Elena (1984), that passed offshore heading toward the Florida panhandle. 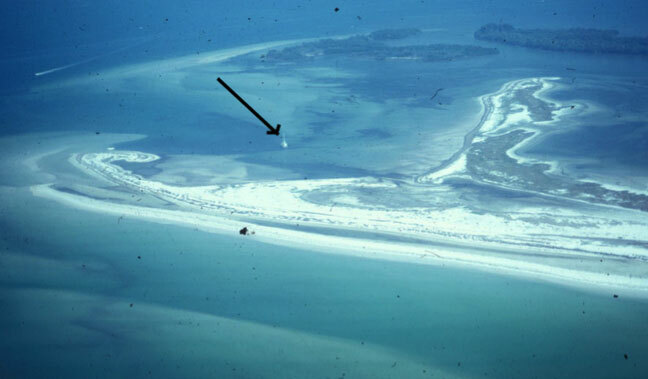 Because of the nature of the shelf gradient offshore of Anclote, there was a modest surge and washover did take place on the north end of the island where dunes had not yet been developed (figure 5). Little happened to Anclote Key morphology until the late 1990s. Huge amounts of sand where transported toward the shore of the southern part of the island in the form of large ridge and runnel systems. These did have some benefit of relative high energy in the form of winter cold fronts. During these frontal passages the strong wind is from the north leading to southerly sediment transport. This was combined with formation of ridge and runnel morphology which has become a rather stable because of its elevation well above high tide (figure 6). There are indications that Anclote Key is slowly evolving into a drumstick barrier because of the multiple ridges that have developed (figure 7). These ridges are not making their way to the shoreline very rapidly and the possibility does exist that a major storm could destroy them and spread the sand over a large area. At the present time these ridges are becoming stabilized to the point that vegetation is beginning to develop. The beach on the island is in good shape. Beaches on this part of the Florida coast tend to accumulate considerable Thalassia after winter storms (figure 8). This situation indicates that there is still significant seagrass offshore of Anclote. Perhaps storms caused the removal of the seagrass in the early 1960s. 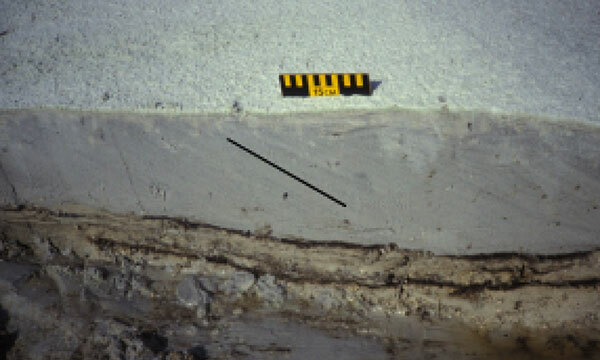 Anclote Key has been in existence for about 1500 years based on a coring study by Kuhn (Davis and Kuhn, 1985). It has had a fairly consistent morphology and size from most of its existence. Because of a series of events this tendency has changed. Over the past few decades Anclote has experienced major changes in its size and its morphology. There are indications that more changes are likely in the future. Davis, Jr., R.A. and B.J. 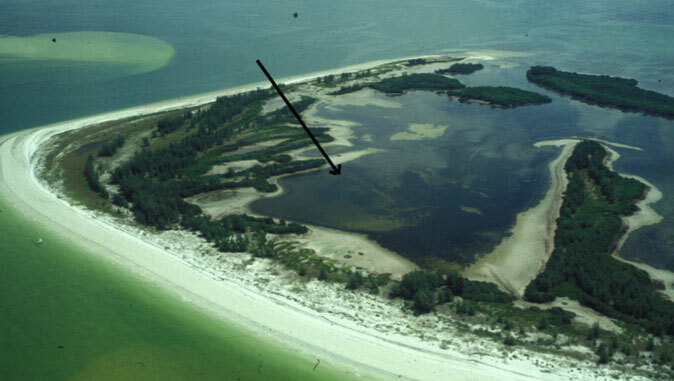 Kuhn, 1985, Origin and development of Anclote Key, west-peninsular Florida.Mar. Geol., 63:153-171.